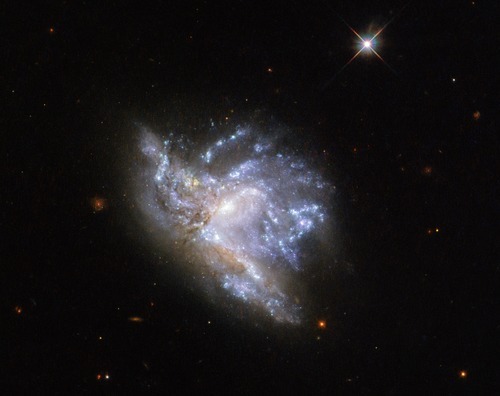 Located in the constellation of Hercules, about 230 million light-years away, NGC 6052 is a pair of colliding galaxies. They were first discovered in 1784 by William Herschel and were originally classified as a single irregular galaxy because of their odd shape. However, we now know that NGC 6052 actually consists of two galaxies that are in the process of colliding. This particular image of NGC 6052 was taken using the Wide Field Camera 3 on the NASA/ESA Hubble Space Telescope. A long time ago gravity drew the two galaxies together into the chaotic state we now observe. Stars from within both of the original galaxies now follow new trajectories caused by the new gravitational effects. However, actual collisions between stars themselves are very rare as stars are very small relative to the distances between them (most of a galaxy is empty space). Eventually things will settle down and one day the two galaxies will have fully merged to form a single, stable galaxy. Our own galaxy, the Milky Way, will undergo a similar collision in the future with our nearest galactic neighbour, the Andromeda Galaxy. Although this is not expected to happen for around 4 billion years so there is nothing to worry about just yet. This object was previously observed by Hubble with its old WFPC2 camera. That image was released in 2015.